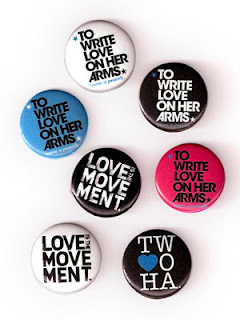 Donate to TWLOHA- I've bought some tshirts from them before, but I've ordered another shirt, a bag, a bracelet and buttons. In order to spread the word a smidge more. I believe that the people who created (Jamie) and are working for TWLOHA are doing an amazing thing. And I believe we all need to love each other or perish. That loving one another is the only thing we're really asked to do. So I will continue to try to do this.